Pan-frying fish fillets, such as sea bass, is perfect for midweek cooking and, what's more, this fish and potato supper is ready in less than 30 minutes. 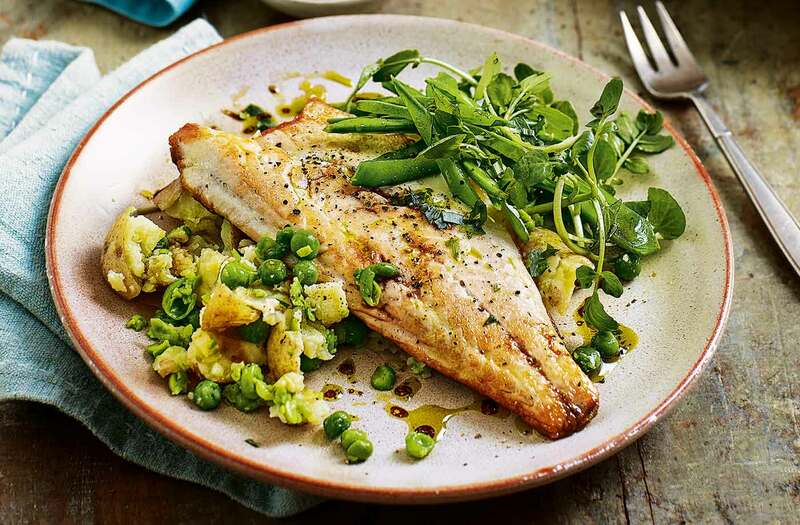 The vibrant smashed pea and potato salad makes a flavour-packed side to the simple fish. Put the mangetout in a heatproof bowl and cover with boiling water. Leave to stand for 1 min, then drain and rinse under cold running water. Shake off the excess water, dry with kitchen paper and set aside. Put the potatoes in a saucepan and cover with cold water. Cover, bring to the boil and cook for 8-10 mins until tender. Add the peas for the last 2 mins of cooking. Drain well; return to the pan. Add the butter to the potatoes and peas, then crush gently with a fork; re-cover to keep warm. Rinse the sea bass and pat dry with kitchen paper. Brush a large frying pan with a little sunflower oil and heat over a medium-high heat. Add the fish, skin-side down, and cook for 3 mins. Reduce the heat to low, brush the top of the fillets with the remaining sunflower oil, turn over and cook for 2 mins until just cooked through. You may need to cook in 2 batches. Toss the tarragon with the watercress, mangetout, vinegar and half the olive oil; season. Pile the crushed potato mix onto a warm serving plate, top with the fish, then the watercress salad. Drizzle with the remaining oil and serve immediately.